Claims backlog • VA claims it is on track to end backlog in 2015. 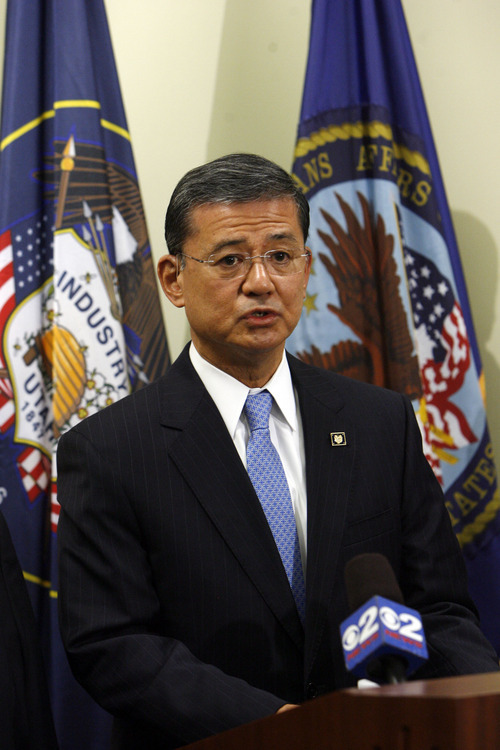 Francisco Kjolseth | The Salt Lake Tribune Eric Shinseki, secretary of Veterans Affairs, meets the press as he visits the VA regional office and the George E. Wahlen Veterans Affairs Medical Center on Tuesday, June 25, 2013. The press event came during his morning visit to the regional office, which handles benefits claims for veterans from around the country. Francisco Kjolseth | The Salt Lake Tribune Eric Shinseki, secretary of Veterans Affairs, visits the VA regional office and the George E. Wahlen Veterans Affairs Medical Center on Tuesday, June 25, 2013. The press event came during his morning visit to the regional office, which handles benefits claims for veterans from around the country. Francisco Kjolseth | The Salt Lake Tribune Eric Shinseki, secretary of Veterans Affairs, visits the VA regional office and the George E. Wahlen Veterans Affairs Medical Center on Tuesday, June 25, 2013. The press event came during his morning visit to the regional office, which handles benefits claims for veterans from around the country. Francisco Kjolseth | The Salt Lake Tribune Eric Shinseki, secretary of Veterans Affairs, visits the VA regional office and the George E. Wahlen Veterans Affairs Medical Center on Tuesday, June 25, 2013. The press event came during his morning visit to the regional office, which handles benefits claims for veterans from around the country. Francisco Kjolseth | The Salt Lake Tribune Eric Shinseki, secretary of Veterans Affairs, visits the VA regional office and the George E. Wahlen Veterans Affairs Medical Center on Tuesday, June 25, 2013. The press event came during his morning visit to the regional office, which handles benefits claims for veterans from around the country. Francisco Kjolseth | The Salt Lake Tribune Eric Shinseki, secretary of Veterans Affairs, visits the VA regional office and the George E. Wahlen Veterans Affairs Medical Center on Tuesday, June 25, 2013. The press event came during his morning visit to the regional office, which handles benefits claims for veterans from around the country. Francisco Kjolseth | The Salt Lake Tribune Eric Shinseki, secretary of Veterans Affairs, visits the VA regional office and the George E. Wahlen Veterans Affairs Medical Center on Tuesday, June 25, 2013. The press event came during his morning visit to the regional office, which handles benefits claims for veterans from around the country. 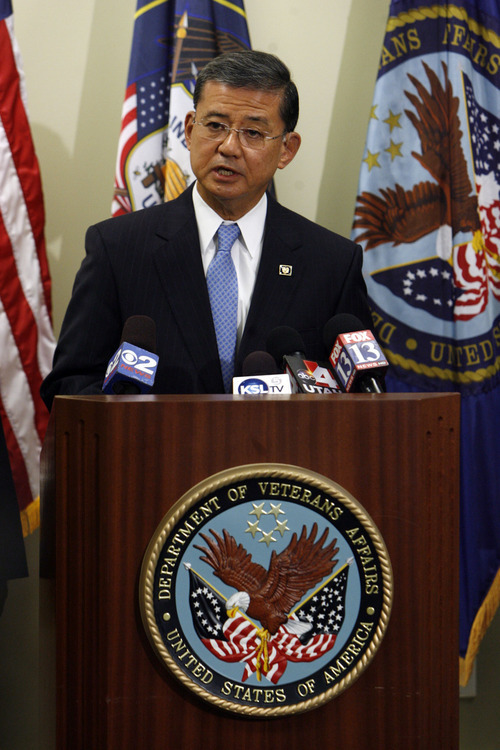 Shinseki spent the day visiting the V.A.&apos;s regional office in Salt Lake City, where claims for disabilities and pensions are processed, and the George E. Wahlen Department of Veterans Affairs Medical Center. He also toured Valor House, a new apartment complex for homeless veterans which opened in March on the V.A. campus on Salt Lake City&apos;s east side. Salt Lake City&apos;s regional office piloted the program last year, he noted. 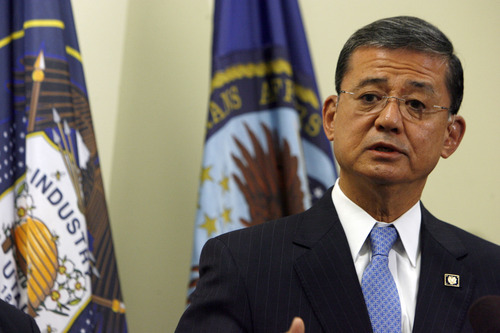 "They did a superb job of giving us a terrific automation tool," Shinseki said of the V.A. regional office, where 577 Utahns work. A V.A. 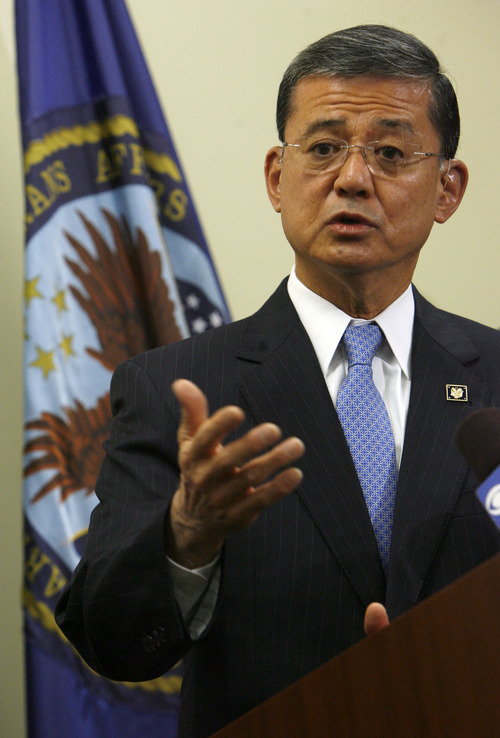 inspector general report dinged the V.A. earlier in the year, saying the VBMS was rolled out before it was fully tested, and that V.A.&apos;s design-as-you-go plan exposed performance issues. For example, an inspector general told a Senate subcommittee, an April 8 update of the system unexpectedly made it unavailable nationwide for two days. 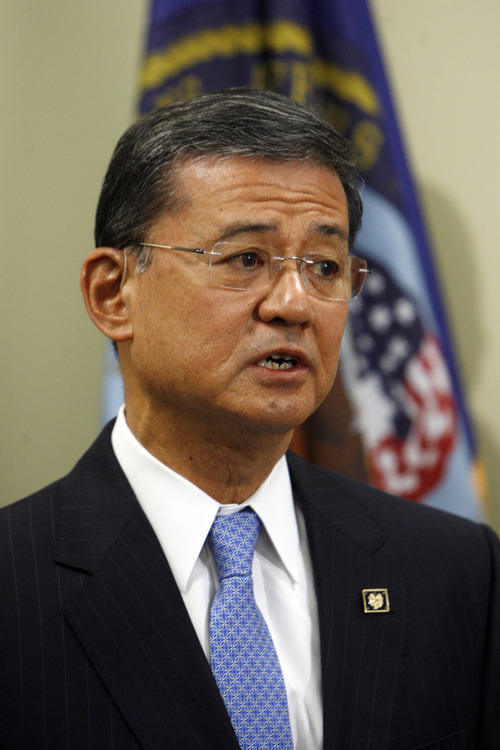 Shinseki said Tuesday that VBMS will be improved and new features added based on feedback from users. New claims files are stored electronically, although those coming over from the Department of Defense will continue to be filed on either paper or electronically through at least December. 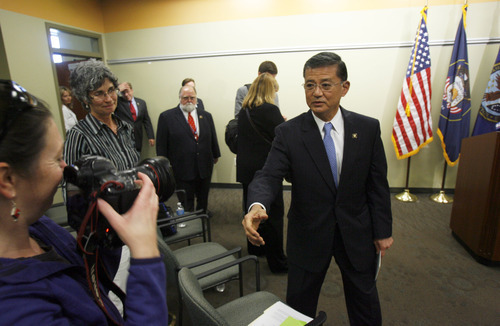 "This is a big crossover year for us," Shinseki said. "We are turning off the spigots of paper even as we are standing up our automation capability." Existing paper files are being scanned so they, too, are digital, but Shinseki said he can&apos;t say how long that will take. "It&apos;s a massive scanning effort." Digitizing records is key to the V.A.&apos;s goal of eliminating the backlog of veterans claims. A claim older than 125 days is considered part of the backlog. The agency has made some progress since March, when pending claims peaked at 822,520, with nearly 72 percent part of the backlog. As of Saturday, there were 749,225 claims pending; two-thirds of them were older than 125 days. 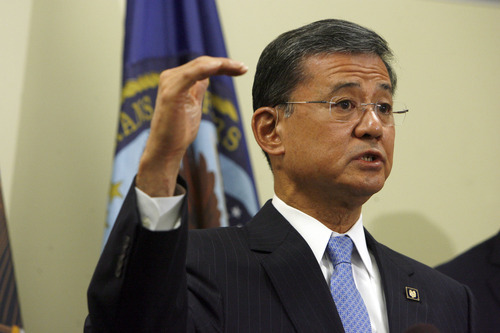 Shinseki pointed to another measure by which he judges the V.A. meeting its 2015 goal. Claims raters throughout the system were processing 80,000 claims a month in February and March, but bumped the number to 94,000 in April and 107,000 in May, he said. "We have production going up in the right direction," he said. Some 20,000 Utah veterans are paid $30.5 million in disability and pension benefits each year. The Salt Lake City Regional Office of the VA has completed 11,295 veterans&apos; claims since October. The VA regional office has 577 employees.